A man from Pennsylvania thinks his great grandfather was a World War I spy. 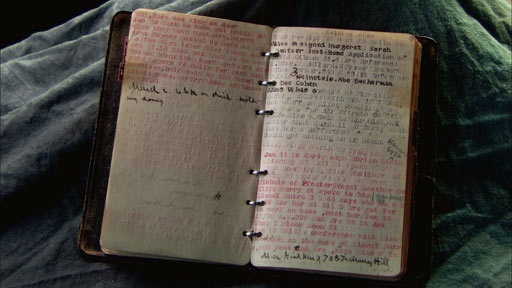 As evidence he has a notebook he believes details his great grandfather’s investigations. Inside the book we see typed entries and handwritten notes, such as the word “pro-German” beside some names, and a section about “The Goldman Case,” which appears to outline a possible assassination plot concocted by anarchist Emma Goldman and her cohorts. Who was John H. Brady and is this his spybook? History Detectives sorts through War Department records, speaks with an historian of the American homefront in WWI and finally heads to the Emma Goldman Papers in Berkeley, California to track down the secrets of this mysterious little black book. View some scanned pages from John Brady’s notebook. Also in Season 8 Copperhead Cane How did this cane inspire a fiery political movement that threatened Lincoln's presidency? Also in Emerging Modern America: 1890-1930 Navajo Rug Why would a weaver depart from tradition to make this rug? Also with Gwen Wright Witch's House Could this house have once belonged to a woman executed during the Salem Witch trials? Also with Gwen Wright Charlie Parker's Saxophone Could this be jazz legend Charlie "Bird" Parker's saxophone? Also with Gwen Wright Monroe Letter Does this letter link America's President to the high seas piracy of U.S. merchant ships in the early 1800s?